The London brewery scene continues to grow at a breathtaking rate – the brewery count recently crossed the 100 mark – and it’s nice to see that the full range of brewery types are well represented in every flurry of openings, from wannabe-Brewdogs, through brewpubs, all the way to a couple of men in a shed. The Muswell Hillbilly Brewers are definitely in the last category; a small outfit that doesn’t even seem to have a website, although have already put together a pretty decent range. 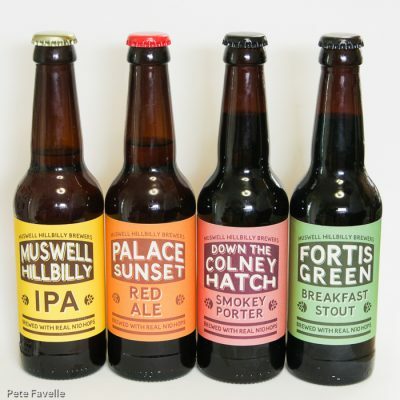 I stumbled across them at the Alexandra Palace Farmers Market and snapped up all four bottles to explore, although I see they have now added a fifth to the collection – a wheat beer saison. A nice touch is that the bottles are emblazoned with the phrase “brewed with real N10 hops”. I’m fairly certain they’re not growing commercial quantities of Cascade, Citra and Mosaic in a secret North London hop garden, but rather they’re added a handful of locally grown hops along with more conventionally-source ones. Given that my ‘fantasy brewery’ (oh come on, every home brewer has that planned out, right?) grows all its own hops and barley, I can’t help loving that they’ve managed to stick to their ‘local’ approach, even if only in a rather symbolic way. 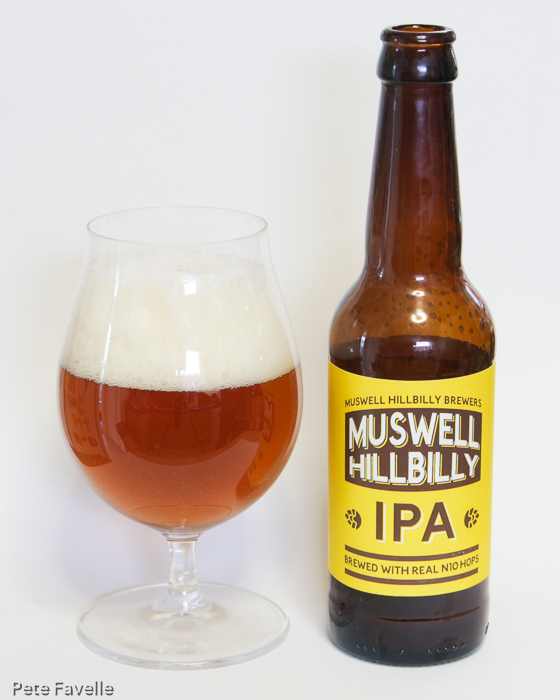 Muswell Hillbilly IPA is a 5.5% golden syrup-coloured beer, with a deep but fairly fleeting head. The nose is surprisingly complex; although the whiff as the bottle opens is all about citrus flowers, once it’s settled down in the glass for a little while there richer aromas too. Toffee, fresh orange juice and a definite alcohol warmth all start to appear. In the mouth it’s well balanced; nicely carbonated, a little initial toffee quickly balanced by a deep hoppy bitterness and just a little pine resin. The bubbles soon sweep that away, exposing ripe oranges, a little brown sugar and just an echo of that bitterness. Complex, it nods towards both a British and American idea of an IPA and somehow manages to pull the mix off rather successfully. Palace Sunset Red Ale is a little stronger at 5.7% ABV. It’s similar in colour to the IPA, but with a definite reddish hue added. The nose is gently sweet; plum jam with a nice malty backbone. I’m not really getting much hint of any hops, though. In the mouth there’s a beautiful balance; light stewed fruit against a drying, slightly acidic bitterness. The hops still don’t really come through as distinct flavours themselves – which leads me to wonder if this bottle is a little long in the tooth – but they’re definitely there balancing out the sweetness. Once again, this isn’t quite what I was expecting from a red ale – but it’s damn tasty nonetheless. Down The Colney Hatch Smokey Porter is 5.5% ABV, and is sadly a proper gusher – but I think at least most of it finally managed to get into the glass! It’s a nicely black porter, with an aroma that is only very subtly smoked – black treacle and some dark berries, with just a little woody smoke. The bottle suggests that the smoke comes from whisky barrel wood rather than smoked malt, which may explain the understated nature. In the mouth it’s fairly dry, with a blackcurrant tartness; the faint smokiness from the nose is pretty much gone – it’s perfectly drinkable, but nothing special and I suspect that its gushing is a sign that things weren’t entirely right in the bottle. Fortis Green Breakfast Stout is a 5.9% ABV stout that pours like crude oil. Sadly, it explodes even more enthusiastically than the Down The Colney Hatch so it ends up evenly distributed between the glass and the kitchen floor. The aroma, however, is wonderful; dark toasted grain, a touch of iron with some espresso lurking underneath. In the mouth the coffee is even more obvious, blending nicely with a satsifying, big-bodied stout – roasted malt, just a little sweetness and a generous body, although the carbonation remains a little heavy. It reminds me very much of my own Coffee Porter, if you’ll forgive me blowing my own trumpet a little! After the first couple of bottles, I was getting excited by this young brewery – it’s always nice to find a brewery that produces distinct beers, rather than the standard lineup of carbon-copy hoppy pale ales. A 50% hit rate on gushers does present a few concerns, but maybe I was just unlucky. It doesn’t put me off searching them out in the future, but I’ll be sure to open the next few bottles in the bathroom!